"The python's head was in the mouth of the alligator and the alligator was just sitting there absolutely still"
A python was seen wrapped around an alligator --with its head in its mouth -- on a golf course in Florida on Friday. 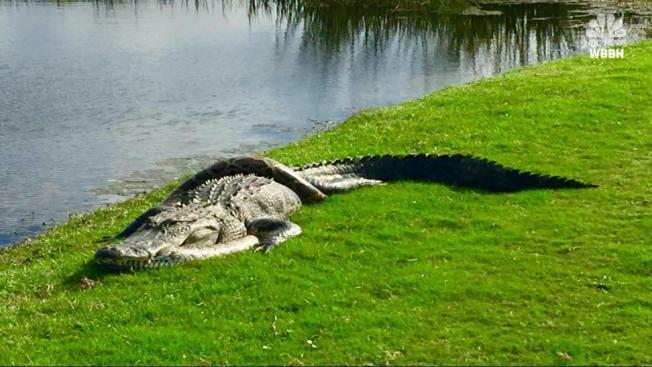 Dr. Richard Nadler was golfing with friends at Fiddler's Creek Golf Club Friday when he came across a back-up at the 10th hole. They asked the people to hurry up because everyone was waiting to tee off. Little did he know, he was about to witness something you don't see every day. 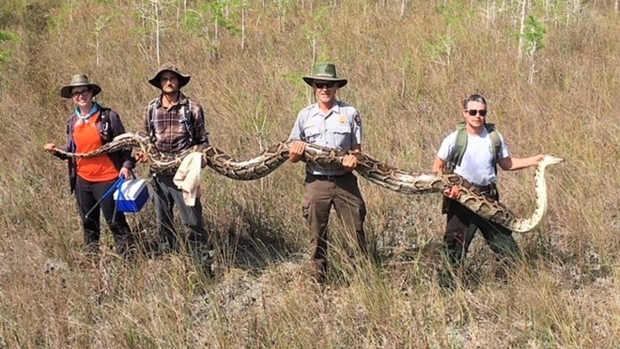 "They drove back to explain to us that it was actually an alligator and python entwined. So that's what everyone was taking pictures of that's what the back up was. So we drove towards the hole and we took a look at the animals and we took pictures and we continued with our golf game," Nadler said. He said it is not that uncommon to see alligators, but this particular scenario was different. "They were absolutely still," he said. "There was no grappling going on, nothing. The python's head was in the mouth of the alligator and the alligator was just sitting there absolutely still with his eyes wide open not moving. And he had all these people around him these golf carts and people walking around taking photographs."